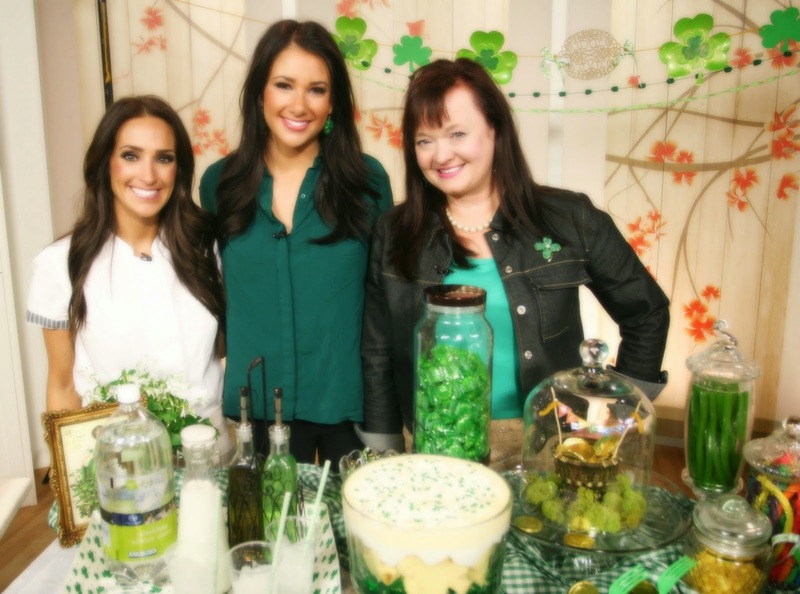 On St Patrick's Day, I did a TV segment on a local Morning News show (KSL-am), and had a lot of fun! I decorated, showed party games, and made a whole bunch of Green and Rainbow food! 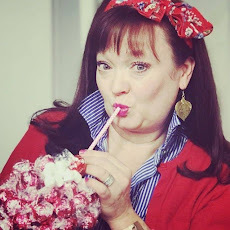 The recipes for all the food items are on my Cooking Blog, Come2myKitchen. I made the banner with a center of a wood cut out from Michaels, and the shamrocks are cut from the centers of paper party plates. I brushed them with gold paint, and strung them onto the yarn. I added a cute little curly ribbon and a strand of green pom-poms. (The same ones as I used on my porch decor). 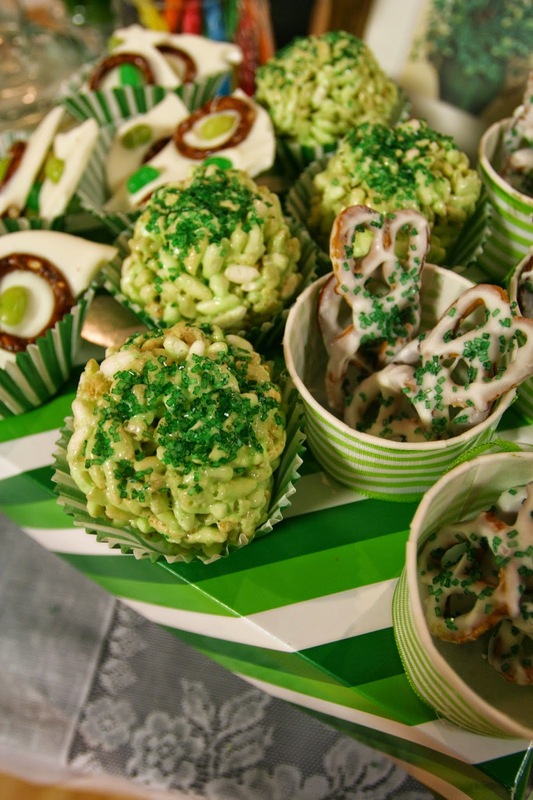 I got a 2 pack of paper serving trays that matched the shamrock paper plates that I used int he banner and for a sample place setting. One of the platters I left untouched, and used it for serving the drinks. The other one, however, I fancied up! I turned it upside down and attached it to two green gingham serving boxes from Dollar Tree (glued one on top of the other to create a base), and then I punched holes in the four corners and cinched them up with coordinating ribbon. While this won't hold heavy items, it worked great for the lightweight dessert cups. This technique can be used all year as these type of paper serving platters and available year round and for the holidays. 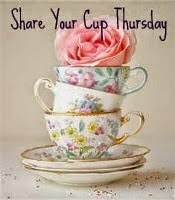 Just look for them wherever you find paper plates. 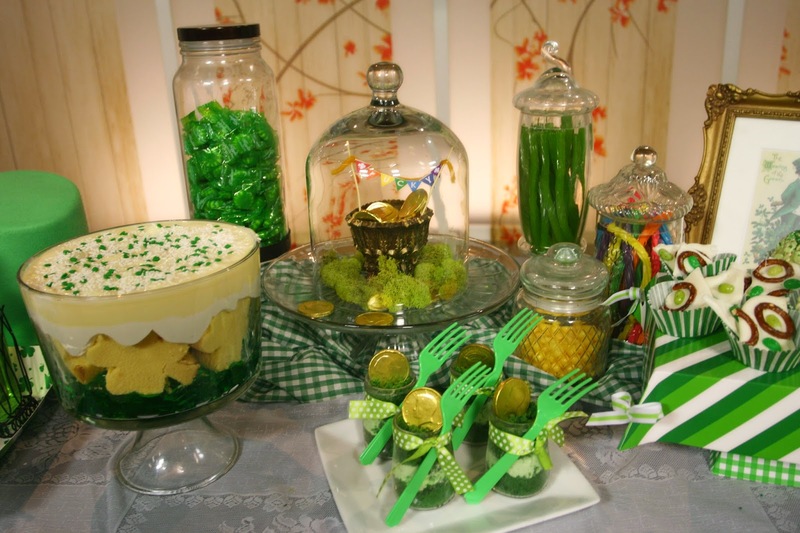 I also added clear jars of candies for the decor: Green apple and Rainbow licorice, Lemonheads, Skittles, and other green wrapped candies. I scattered them around the table along with a Lady and Sir St Patty's Day vintage postcards that I found online and printed up at home and placed in matching gold frames. I got the printable flags from Hoosier Homemade. I sized them down before I printed them. They were exactly the "rainbow" touch that I needed for this vignette under a glass dome. I placed it on a glass platter to give it some height in the display. The pot came from thrifting (all of 50 cents!) and I gave it a dry brushing of metallic gold paint to liven it up. 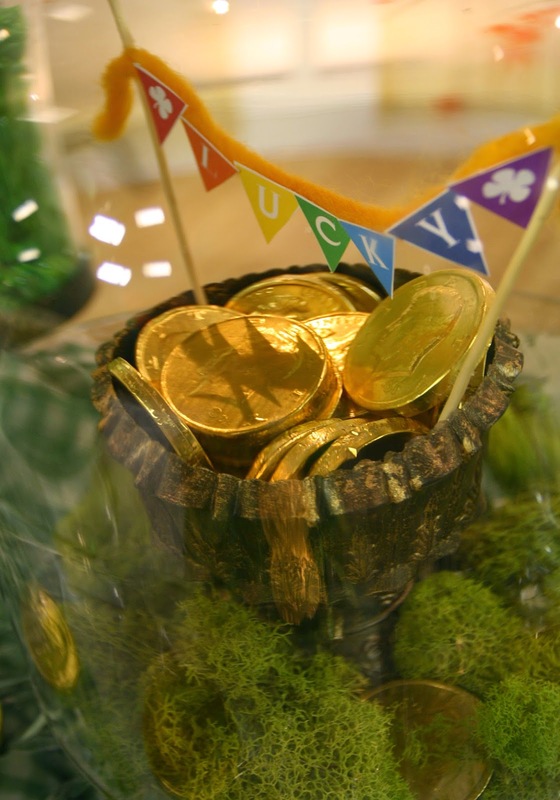 Gold coins and reindeer moss completed the look. 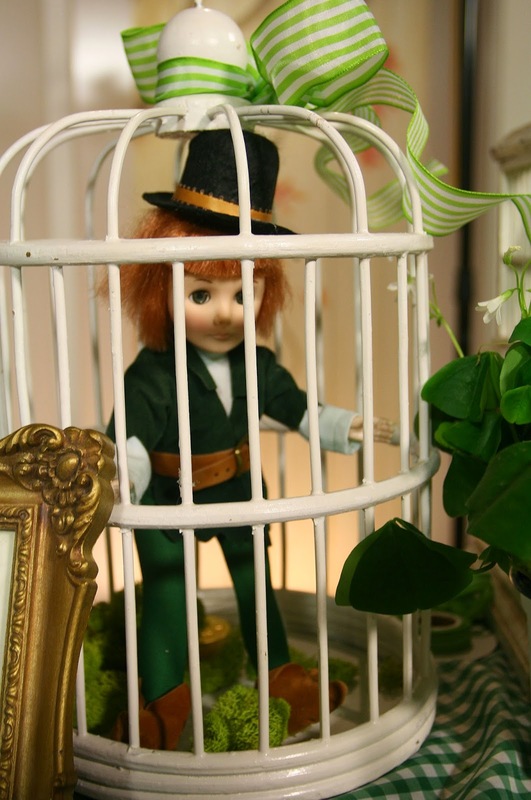 This vignette was previously residing on my mantle for my St Pat's design. It didn't take me long to make this Trifle below, but I made each component separately and then put it together at the last minute. It didn't end up getting highlighted during the segment, but it sure did look great! I love how the very bottom layer was almost see-through with the Jell-O! 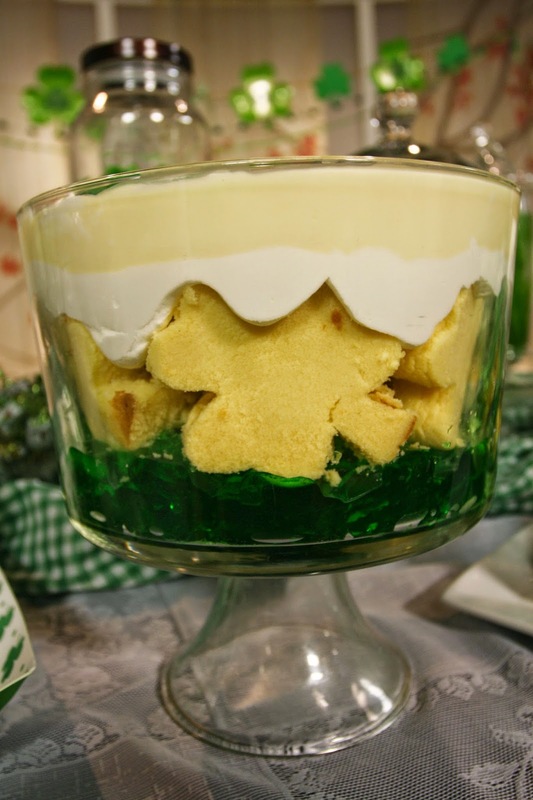 I cut the pound cake pieces thick so they could hold the weight of the cream, custard and pudding layers on top. 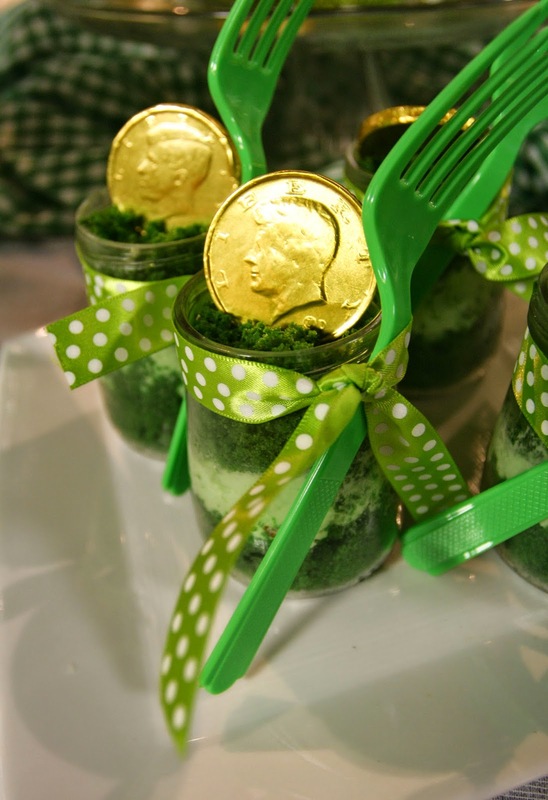 These little dessert cake cups were my favorite food element...check out my recipe post for where I got the jars from! 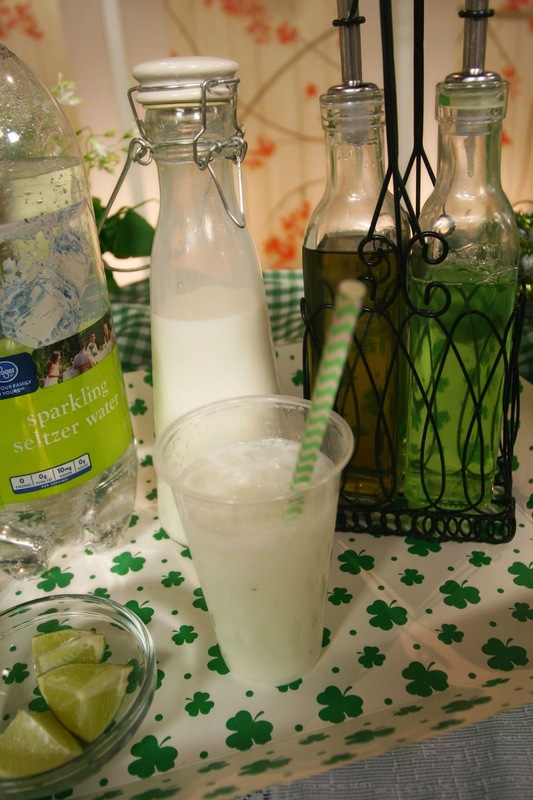 I renamed these Italian Creme Sodas to "Irish Creme Sodas" for the day. I made my own Simple Syrups and they were delicious together! 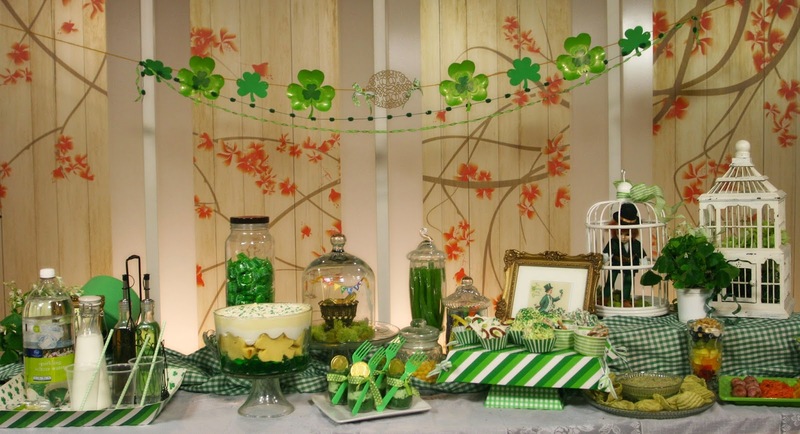 The other end of the table featured my "Leprechaun Trap" with a Shamrock plant and another birdcage. The TV crew all got a little freaked out by my Leprechaun in his "trap"! We didn't highlight it during the segment, so I think they were a little befuddled as to why I would have it on the table! 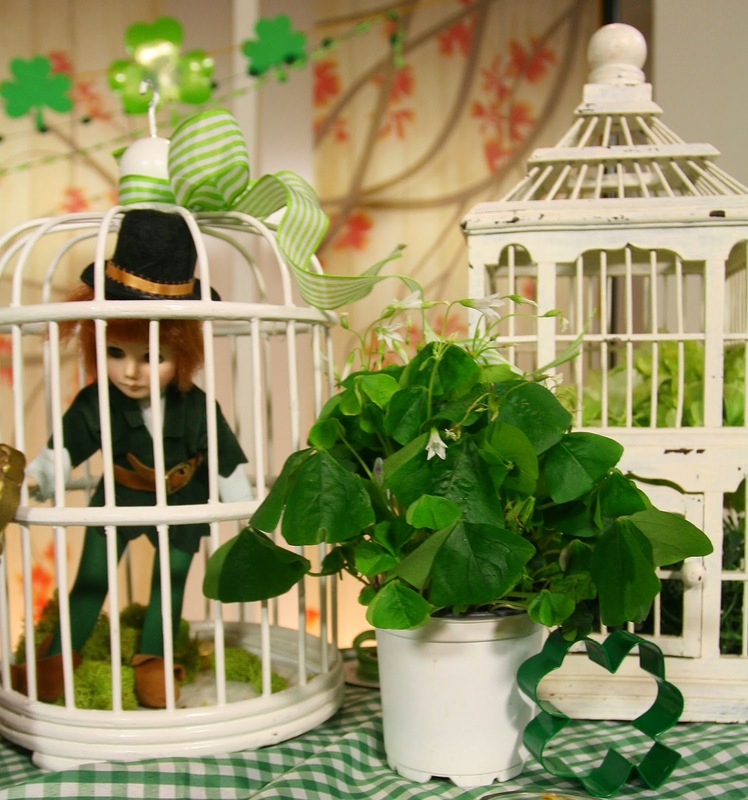 I think he's cute, and in truth he's just a Peter Pan doll that I added a leprechaun hat to! The host, Haley Smith, that invited me to do the segment with her. She needed a "selfish" with the little guy! haha! Remember, you can find all the recipes HERE, and you can also watch the video below! If the embedded video is not showing, this is the link for it. Great segment ! Great job! You looked great! Beautifullayout!cograts! Thanks Cindy...that's sweet of you!